Here is where you will find our ministerial products and we hope that you will find all the spiritual resources you need to help you with you walk with Christ and or maybe something here will introduce you to our Lord and Saviour Jesus Christ! This powerful Salvation Series taught by Pastor Lonny Bereal is good for any all who need to know the imporance of Salvation. This also makes a great gift! 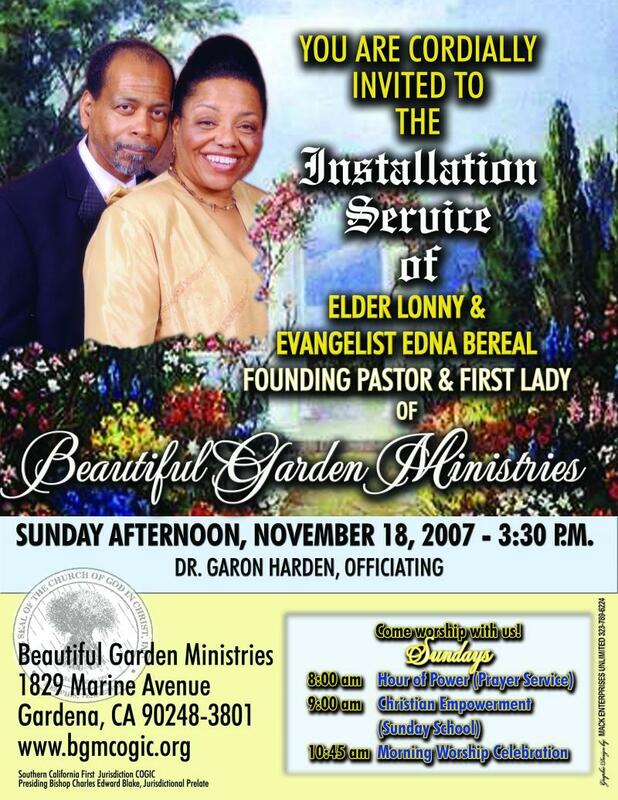 November 2008 Pastor Lonny Bereal Sr. was installed as the pastor of the Beautiful Garden Ministries COGIC. Catch the great installation message by Dr. Garon Harden as he inspires, encourages and uplifts the body while sending off Elder Lonny and Evangelist Edna Bereal to do the work of the Lord. Many friends have asked how can they contribute to the ministry and so we have set up a 10.00 donation option. If you desire to join with us in our mission to reach the lost in the surrounding areas of Gardena CA then your donation will help us with our various mission projects.